The fight against cancer is very important to me. Twenty-three years ago, my grandfather died after a battle with prostate cancer. More recently, Superman Sam – a child whom I never met in person but who we got to know and love thanks to social media – lost his battle with leukemia. Anything that helps the fight against cancer is fine in my book. Recently, a campaign was launched to get guys to post photos of themselves. These were not the usual selfies, though. These pictures showed the men with nothing but a sock covering their private parts. You’ll excuse me if I don’t see how this helps. When I first heard of it, I didn’t hear "new testicular cancer awareness campaign." I didn’t even hear that this was related to cancer at all. All that I heard was that some people were stuffing their "selves" into socks, taking photos of themselves, and posting the photos online. It seemed like just some weird perverted form of the selfie phenomenon. Eventually, I heard that this was meant to help fight cancer. It took TheDaddyYoDude’s post to let me know that this was specifically targeting testicular cancer. Like I said, I’m all for fighting cancer, but outrageous and shocking awareness campaigns are often counterproductive. First of all, the campaign actions can overshadow the cause. 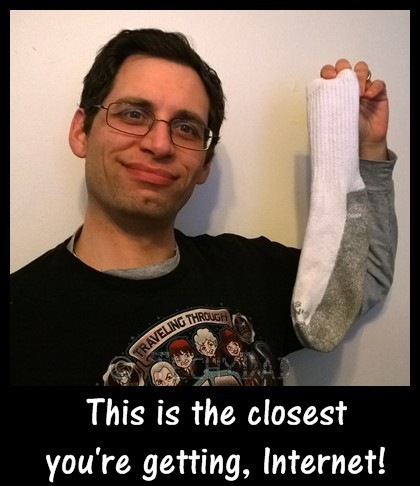 In this case, for every person who learns about testicular cancer thanks to this "socks" campaign, too many more will just see nearly-naked men wearing socks over their members. The second problem is that these kinds of campaigns increasingly raise the bar for what is needed to shock people into awareness. Once people are no longer shocked by socks, what’s next? People posting close-up photos mid-colonoscopy? Graphic photos of couples mid-coitis to raise awareness against STDs? What do you think about this "socks" campaign? Will it actually help in the fight against testicular cancer or is it all shock and no value?